M-888 camera is the newest hand-held intra oral camera from us. Its lightweight design and smooth contours makes it both comfortable to hold and easy to use. Taking images with camera’s integrated capture button makes video capture a simple one-step operation. And its built-in LED light source provides reliable, long-life illumination. 6. It can save 9999 pcs pictures in USB flash disk. 7.WIFI,Video and VGA output functions. 8. It can record the video by the remote control, size of memory according the U disk, the picture and the video can be save to USB flash disk permanent. 10. WI-FI device can transmit the camera’s images to mobile phone, Tablet PC at the same time. Tell us what you think about New Designing WIFI Intra Oral Camera M-888, share your opinion with other people. 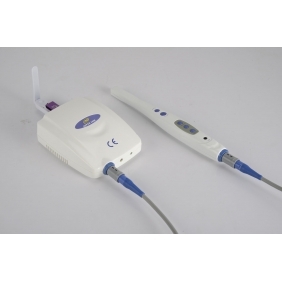 Please make sure that your review focus on New Designing WIFI Intra Oral Camera M-888. All the reviews are moderated and will be reviewed within two business days. Inappropriate reviews will not be posted.